News, Reviews and more… for people who just LOVE movies. From Walt Disney Animation Studios (“Frozen,” “Wreck-It Ralph”), Disney’s “Big Hero 6” introduces you to a lovable robot who will change your world. Join Baymax (voice of Scott Adsit) and Hiro Hamada (voice of Ryan Potter) in a comic adventure that will make your heart soar as they learn about teamwork and becoming more than you thought you could be. SYNOPSIS: With all the heart and humor audiences expect from Walt Disney Animation Studios, “Big Hero 6” is an action-packed comedy adventure that introduces Baymax, a lovable, personal companion robot, who forms a special bond with robotics prodigy Hiro Hamada. When a devastating turn of events catapults them into the midst of a dangerous plot unfolding in the streets of San Fransokyo, Hiro turns to Baymax and his diverse group of friends — adrenaline junkie Go Go Tomago, neatnik Wasabi, chemistry whiz Honey Lemon and fanboy Fred — who transform into a band of unlikely heroes. 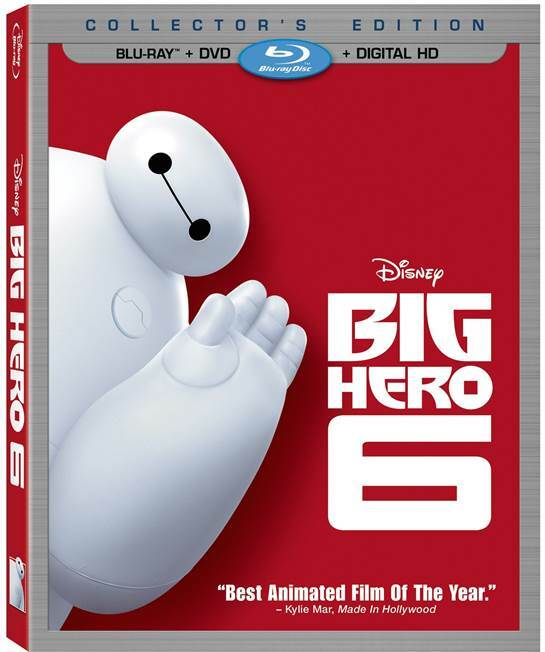 Bring home Disney’s “Big Hero 6,” featuring comic-book-style action and hilarious, unforgettable characters — it’s fun for the whole family! VOICE TALENT: Ryan Potter (“Save the Date”) as Hiro Himada, Scott Adsit (TV’s “30 Rock”) as Baymax, Jamie Chung (TV’s “Once Upon A Time”) as Go Go Tomago, Damon Wayans, Jr. (“Let’s Be Cops,” TV’s “New Girl”) as Wasabi, Genesis Rodriguez (“Identity Theft”) as Honey Lemon, T.J. Miller (“Silicon Valley”) as Fred, Maya Rudolph (“Bridesmaids”) as Aunt Cass, James Cromwell (“The Green Mile”) as Professor Robert Callaghan, Alan Tudyk (TV’s “Suburgatory”) as Alistair Krei and Daniel Henney (“X-Men Origins: Wolverine”) as Tadashi Hamada. Big Animator 6: The Characters Behind the Characters – Join the six lead animators of Big Hero 6 as they talk about each of the characters and how they came to be the heroes they are now. Deleted Scenes (intro by Directors Don Hall & Chris Williams) – Includes two alternate openings and more. FEATURE RUN TIME: Approximately 102 min. Disney Movies Anywhere (DMA) is an engaging and family-friendly cloud-based digital movie service that makes it simple to buy your favorite Disney, Pixar and Marvel movies once and watch them anywhere. With DMA you can explore Disney’s library of over 400 eligible digital movies, discover hours of new and exclusive short-form content, and watch your digital movies from the comfort of the living room or across multiple mobile devices. In addition, you can redeem Digital Copy codes found in Disney, Pixar and Marvel Blu-rays and DVDs, as well as earn Disney Movie Rewards points with every digital purchase. Sign up and access Disney Movies Anywhere for free on DisneyMoviesAnywhere.com and through the Disney Movies Anywhere iOS and Android apps. Users can then simply connect their iTunes, Google Play and/or VUDU at VUDU.com/DMA accounts to begin enjoying their Disney, Pixar, and Marvel digital movie collections across platforms and devices.